According to Phily.com, the fans paid anywhere from $50 to $65 per item for Manuel to sign, and he didn’t just go through the motions. He told many of the autograph seekers that it was nice to meet them, and he seemed taken aback by the huge turnout and the fans’ enthusiastic response. He stayed over two hours and signed over 400 autographs. Manuel, who was fired and replaced by Ryne Sandberg on Friday, August 16, said the possibility of breaking his commitment at the Granite Run Mall never crossed his mind. “I had a commitment today, and I wanted to make sure I did it,” Manuel said. In 2010, Manuel managed the Phillies to their fourth consecutive NL East title. The team became the third NL team in history to play in the postseason in four consecutive seasons, joining the Braves (1991–2005, excluding 1994) and the New York Giants (1921–1924). The Phillies finished the season at 97–65; it was the first time in franchise history that they had completed a season with Major League Baseball’s best record. 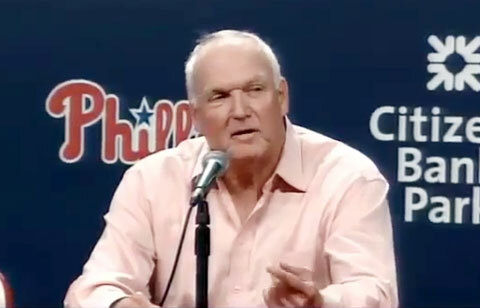 If you would like to book baseball legends like Charlie Manuel for a speaking engagement, autograph signing, guest appearance, golf tournament, marketing or PR campaign, charity fundraiser or special event, you can request Charlie Manuel speaker & booking agent info or call 800.966.1380.